Just about to leave the California coast (after a few days) to start heading north along the coast. Exhausted and smiling. You can’t assume Nogg and his crew are going to get a planet blown up just because Joyce was going to get a planet blown up. I love King’s big closed-mouth toothy grin almost as much as I love his closed mouth grin. Looks like the not-so-secret society isn’t completely inept. Oops, second one should be open mouth grin – my favourite one. 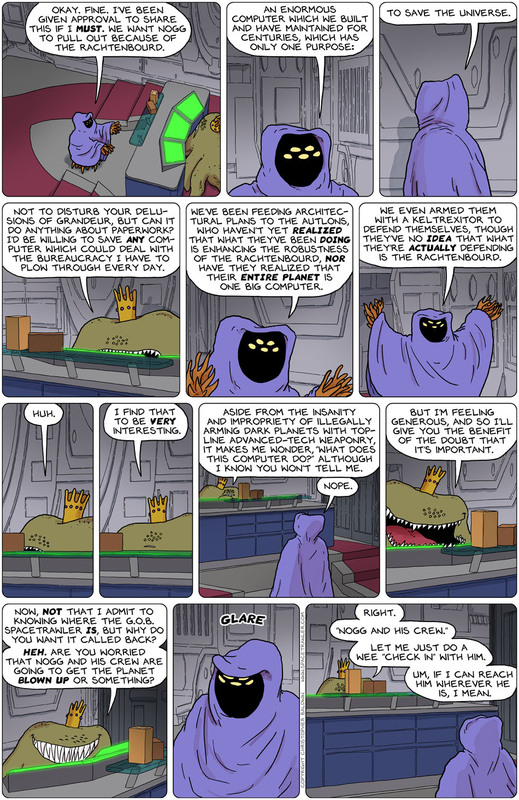 @Chris did the 5-glaring-eyes-in-a-robe deliberately misspell “Aulton” [“Autlon”] in panel 5 or was this a glitch? Interesting! Thanks for deciphering that possible ‘Easter egg’ for us. Chris, do you normally put little Easter eggs in your strips from time to time? I wondered before and now with Rächtenbourd and just a few strips before, Mr. Zorilla planting seeds of Mimosa pudica (sensitive plant) makes me wonder. Such large hidden things can find themselves in the middle of things without it ever being planned or expected. I’m re-reading the whole current adventure, noticed the misspelling of Aulton as Autlon in panel 5, saw that andreas mentioned it in a comment above, and that Christopher hadn’t responded, so I’m echoing andreas’s comment about the misspelling. And loving the current story, of course.